The New World Order The New World Order: Florida High School Shooting - State-Sponsored False Flag Or Just A Violent Event? 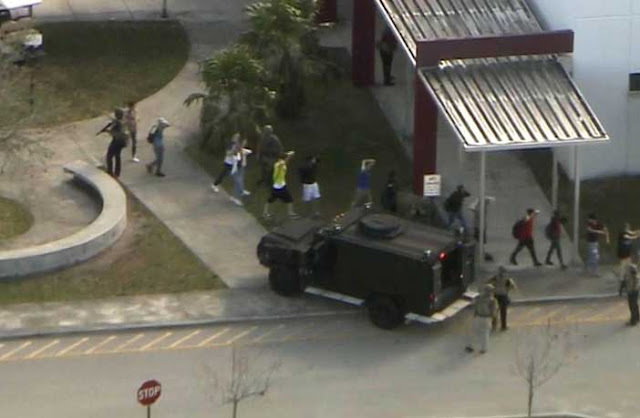 Florida High School Shooting - State-Sponsored False Flag Or Just A Violent Event? Numerous shooting incidents in America turned out to be false flags. Most often suspects are killed. Dead men tell no tales. False flag incidents aim to stoke fear. The 9/11 mother of them all launched endless US wars of aggression, the incident used as a pretext to wage global war OF terror at home and abroad, not on it. It’s too soon to know whether hidden motives lay behind Wednesday shootings at Majory Stoneman Douglas High School in Parkland, Florida - a violent incident or state-sponsored false flag? Suspicions are warranted when mass shootings in US or European cities occur. Was suspected 19-year-old gunman Nicolas Cruz guilty of mass murder or a convenient patsy? NeighborhoodScout ranked it the 15th safest city in America with populations of 25,000 or more. Unruly youths don’t usually express anger by mass shooting people. The number of victims in Wednesday’s incident suggests maybe more than one gunman was involved. It’s unknown if Cruz was one of them or set up to be blamed. Solid evidence proved the Las Vegas one-gunman claim was a bald-faced lie. Shooting came from multiple directions. Suspect Stephen Paddock is dead so couldn’t talk. From what’s known, it appears he was used as a convenient patsy. The same disturbing pattern repeated in these type incidents earlier - in America and Europe. Was Parkland, Florida the latest one, something other than what’s being reported? According to #false flag, the Parkland school “had active shooter training” before the incident. A drill was conducted Wednesday morning - before the shootings occurred. A coincidence or something more sinister? On 9/11, simulated hijackings occurred on the same day. The CIA simulated a pre-planned emergency response required if a plane struck a building. Held at its Chantilly, Virginia Reconnaissance Office, it simulated a small jet aircraft hitting one of its buildings. In October 2000, the Pentagon simulated a commercial plane striking its building. Pre-9/11 exercises preceded the real thing. In March 2004, Madrid train bombings occurred three days before Spain’s general elections. Al Qaeda was blamed. No evidence proved it. Fear was stoked, suggesting follow-up attacks against other Western targets, including American ones. On July 7, 2005, so-called London 7/7 underground bombings attacked the city’s public transport system - during the morning rush hour for maximum disruption and casualties. At precisely the same time, an anti-terror drill occurred, simulating real attacks. No action was taken. Israel’s then finance minister Netanyahu was told to skip a London economic conference where he was scheduled to speak. When students were evacuated from the Parkland Florida high school, some thought it was part of the day’s drill. An image posted online showed no one in a stretcher suspect Cruz was supposed to be in. Youths interviewed after the incident appeared older than high school students. They repeated the same talking points. Tweets and videos were readily available from inside the school. Before and during the shooting, fire alarms occurred. Students said they were prepped for this type incident weeks earlier. Why? Two ambulances on the scene had no bodies in them. An unverified video showed men loading weapons on a truck near the school. Most disturbing, one student said she was speaking to Cruz when she heard gunshots elsewhere in the school. She didn’t see a gun in Cruz’s possession. He was accused of using an AR-15 semiautomatic rifle with multiple magazines - not easily concealed beneath clothing. He was arrested off-campus after the incident occurred. Separating facts from fiction about the incident needs to be sorted out before conclusions drawn. Incidents have motives. What’s behind this one is unclear. What’s known raises suspicions about what lay behind the incident. If a false flag, was it to distract attention from disturbing events in Washington? It’s unknown. The fullness of time will likely explain more.